I just spoke to Dave at Sweetgrass Rods in Twin Bridges, MT and he said that we, in the East, have much to be thankful for…at the time were talking about the Blue Point Oysters that Gunpowder Guide Bill Wolf dropped off before the thanksgiving holiday, (thanks Bill) and Dave mentioned that I was lucky to live so close to the ocean. I immediately started thinking about all of the wonderous trout water he was so lucky to live next to; the Beaverhead, the Bighole the Ruby, the Jefferson, well, you get the idea. This is a photo Dave sent along during our ramblings of some of the reel seat spacers that Sweetgrass offers. 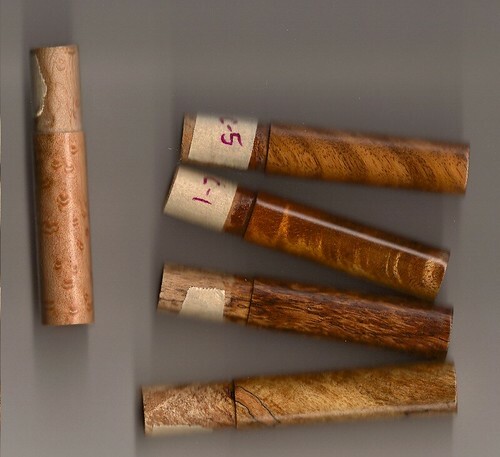 Two hex, (six-sided) bamboo rods shipped from Twin Bridges today and should arrive in the shop early next week. They are both 7′ 9,” 4/5 wt, 3/2, (that is 7 ft 9 inch rod for a 4 double taper or 5 weight forward floating line, in 3 pieces, with 2 tips). The rod with a half-wells grip fitted with a nickel silver downlock teak spacer, (C-1), is spoken for, the other, with a cigar grip, and fitted with a nickel silver downlock Birdseye Maple spacer, (pictured on the left) is up for grabs. Pricing for Sweetgrass 3 pc. bamboo rods is $2, 500. Please give us a call at 410-357-9557 or drop us a line at info@backwaterangler.com to discuss this rod or any other Sweetgrass fly rods that catch your fancy. Personally, I’m thankful that these guys are still building beautiful rods and have sentiments like this expressed on the Sweetgrass Fly Rods website. It is our intention to do our share to preserve the traditions of a unique American craft. In an age where time is money and more cheaply produced outsourced goods rule the corporate world, we believe there is still a place for quality craftsmanship done the old fashioned way. What we build will have a heart, soul, and spirit connected to our sense of history, community, and obligation to the resource that makes what we do possible. This entry was posted in gear, news on November 26, 2008 by Theaux Le Gardeur. The shop will be closed on Thursday, November 27, 2008 in observance of the Thanksgiving holiday. However, the shop will be open from 10 till 6 PM on Friday and from 8 AM till 4 PM on Saturday and Sunday. Have a safe holiday and with any luck we’ll see you on the stream! This entry was posted in news on November 26, 2008 by Theaux Le Gardeur. The recent cold spell we got in Baltimore County in mid November had me digging out the Winter layers; hat, gloves and baclava. The fishing has been great on the Gunpowder, and as always many calls and shop visitors are curious whether the fishing is worth braving the cold through Winter? If temps in the mid thirties and a light snowfall doesn’t seem too inviting, consider this video post from the Salmon River, NY shot in late February 08. My friend Matt and I fished for a week in temps ranging from the high teens to the mid twenties at the daily high, which was IF the sun broke through the clouds. We had to deal with daily snowfalls, wind, frozen waders and the loss of feeling in toes and fingers for extended periods of time. Ice on the guides was a reason to take constant breaks and brew some coffee riverside to warm up. Extremities freezing wasn’t the only problem, as I hooked a good steelhead only to realize my reel was frozen solid. The fish wanted line, but the reel wouldn’t give, so I gave a heavy handed, hard tug on the line. Imagine my horror when the fly line snapped, and the fish was no longer attached to the reel, but to a mere foot of slack held in a mitten clad hand. We landed that fish on 4x tippet, and it fought hard, just minus the blistering runs. If you ask me, as long as the water is still flowing, it’s never too cold to fish. This entry was posted in video on November 26, 2008 by Jason du Pont. 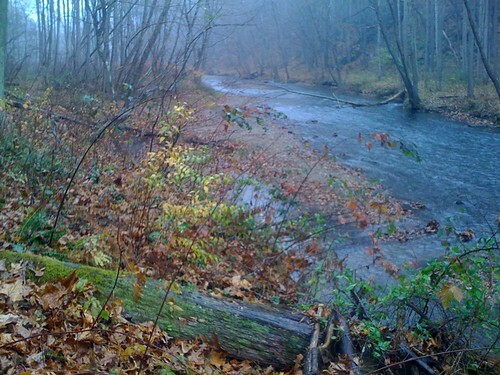 The Gunpowder river is flowing at 55 Cfs, is 52 F and is clear. To say that the fishing has improved markedly since we’ve had spillover is an understatement. BWO’s have been having a hard time getting off the water, (read cripples and emergers) during the cold, windy afternoons and the fish don’t mind at all as the following stream report attests.Thanks to Backwater Angler Guide Dave Smith for the following report from Thurs Nov 20 and Fri Nov 21. On Thurs. fishing (and catching) was as good as during the peak of the sulfur hatch! Started fishing the riffles at the base of the Falls Rd high trail around noon and did well with a bead-head brassie. Around noon the sky was partly sunny and the air temp was 48 but by 2pm, the clouds rolled in, some snow flurries started and so did the olive hatch. All the flat water areas came alive with rising fish; counted 40-50 fish rising within 50 feet of myself. Ran through nearly all my olive patterns and finally found a size 18 down-wing emerger pattern that the fish liked. Ended the day around 4:30 with a 16 inch brown!…also caught several 12-13 inch browns, numerous brownies under 10” and a surprise13-14” wild rainbow. 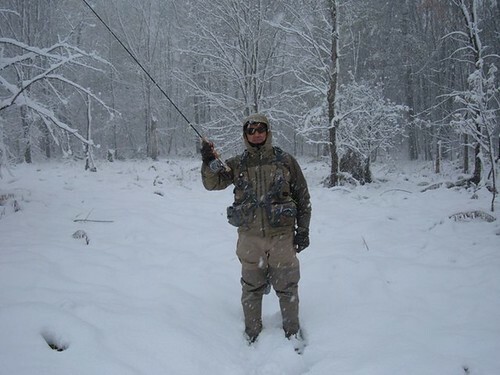 Friday afternoon was colder (around 38 degrees) and snow flurries came and went the whole time fishing. Fished (and walked to stay warm) from the high trail all the way down to Falls Rd bridge. Fished the rifles with a bead head olive and caught many browns under 12.” Around 3:30 the fish started to rise here and there and started to take my indicator fly (a size 16 caddis..go figure) ended up the day with three more fish over 12” on the caddis! Even had a double header and saw that the fish on the indicator fly was larger than the one on the dropper. The big fish got off and the “smaller one” on the dropper turned out to be a 12” brown! Don’t let the cold weather or stock market get you down; get out there and enjoy the great fishing and beauty of the Gunpowder in the Fall. 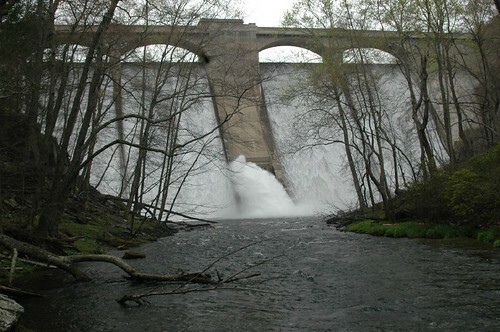 PS: Water is coming over Prettyboy dam so the flow is perfect for good fishing. 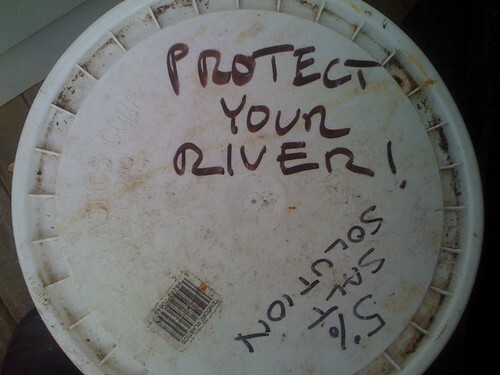 This entry was posted in fishing report on November 22, 2008 by Theaux Le Gardeur. 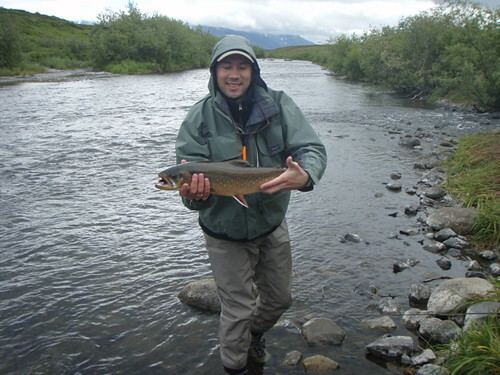 Thanks to Louis Kovacs for the following report from a mid-August fly fishing trip in SW Alaska. I find myself, this month, in Bethel, Alaska, for some medically related stuff. It’s not picture-book Alaska, it’s the tundra. No trees, no mountains. 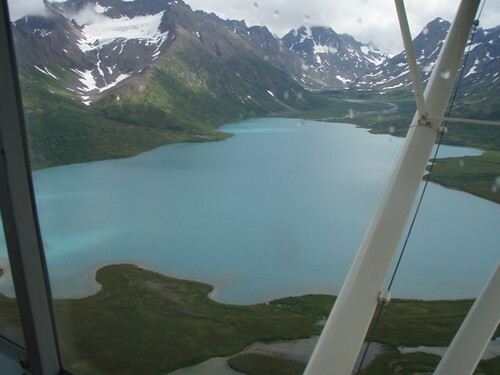 But both, along with some fantastic lakes and streams, full of trout and salmon of all kinds, are reachable in a few hours by boat or float plane. It’s an incredible experience, being in a plane so small it feels like you’re wearing it, landing on crystal clear glacial lakes surrounded by mountains, hiking through bear trails passing all too freshly eaten salmon down to a stream absolutely packed with Dolly Varden, grayling, huge rainbows, silvers, reds, char, and God knows what else, all ferociously hungry and impossibly bold and eager to take flies. Here are some pictures from 2 days of fishing that I won’t soon forget. This entry was posted in news on November 20, 2008 by Theaux Le Gardeur. After numerous rain storms and a good deal of waiting Prettyboy Reservoir is finally spilling over into the Gunpowder River. On Friday it began as a small trickle of water, but with storms through Friday night into Saturday the river rose over 40 Cfs and leveled out in the mid 70 Cfs range! After helping a Backwater Angler guide get his clients out the door early on Saturday, I was itching to fish during the rise in flows and took the day off (thanks Theaux). I chose to fish the mid-lower section of the C & R area, which has been particularly challenging in recent low flows. The clarity was just off a little, which was perfect. 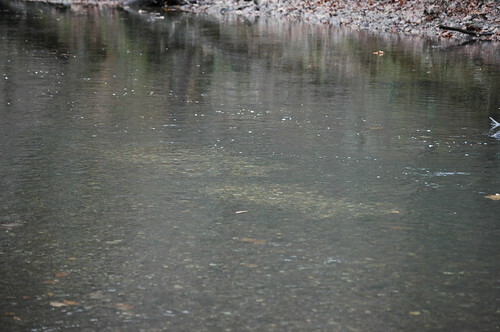 The water level climbed with the added spillover, on and off rain, and resulting runoff from various creeks and bridge crossings. I tried two access points and saw only two other anglers on the river, and one was a BWA Guide. The fishing was exceptionally good and many of the browns, 9-12 inches, were holding in deeper pools, and runs. Browns were eating attractor nymphs as well as zebra midges, caddis larvae patterns and nymphs in the 16-22 range. 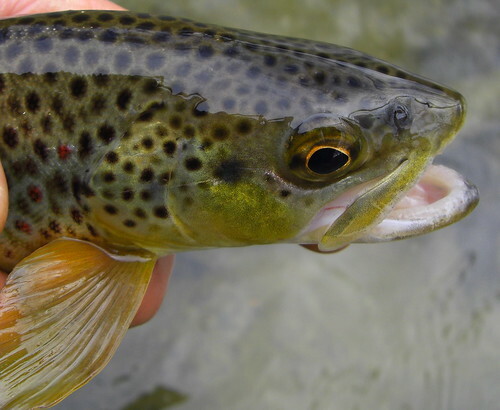 Areas which seemed to lack good numbers of fish the past few months yielded up to 3-5 fish per pool or run. As long as the inflow to Prettyboy is greater than the outflow, we should see water continuing to spillover, although it may slow after some time. This entry was posted in news on November 17, 2008 by Jason du Pont. Thanks to Gary Corriero for the following fly fishing report from the Salmon River, NY. A couple of pictures from my trip to New York’s Salmon river week ending 10/31. I purposely moved the trip up a week to avoid November’s bad weather. As you can see by the first picture…it didn’t work out the way I planned. That’s the 7wt Scott E2 and Lamson Velocity reel you sold me last year. I didn’t break out the new 6wt Scott S4 because the water was running high and I needed a bit more power to control the fish. Despite the weather, not all days were bad, we did fairly well landing over 25 and losing far more. There were also some fresh Atlantic salmon still coming in. The second picture is a beautiful chromer fresh in from the lake. The fish were feeding on sucker spawn and pink san juan worms!! You know I don’t tie flies so you should have seen some of my “creations” of the san juan…a hook strategically placed in the middle of a 2 inch piece of pink yarn…hey it worked! I did fish the top section of the Gunpowder on Sunday, 11/9. You can just ditto Jason’s report on the tricos and add bluewings. Fished from noon to 4pm and about every 30 minutes or so there would be a “cloud burst” of tiny tricos and bluewings. Emergers in both groups were working well and I caught over a dozen nice fish in the 6-8 inch range. I had a couple of big rips from fish that felt heavy but I missed them. The water was low but it was nice to be on the river.